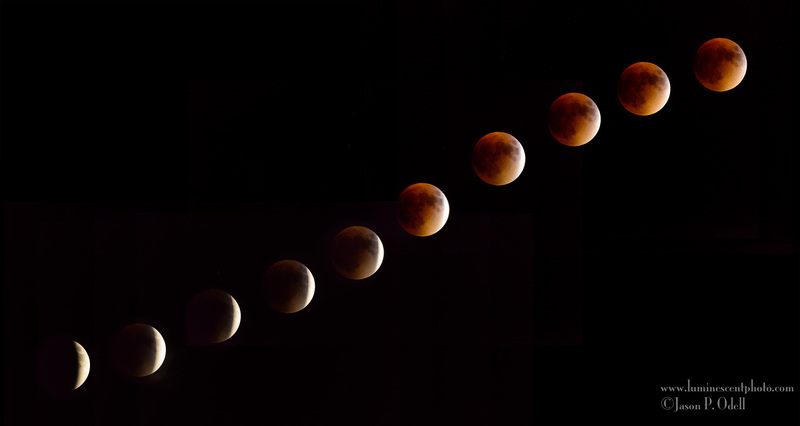 The total lunar eclipse on September 27, 2015 as seen from Colorado Springs, Colorado. After a few low clouds passed through, I got a pretty good view of last night’s “Supermoon” eclipse. I set up my Nikon D810 on a tripod with the 500 mm f/4 AFS G VR Nikkor, and used my intervalometer to capture photos every two minutes. As the eclipse progressed, I tweaked exposure settings to make sure I captured the orange red glow of the eclipse. I then merged the images in Photoshop to create this composite. Interested in photographing the night sky? Check out The Night Sky Photography Handbook.